With each shave, each day, you get an opportunity for reinvention. Looking to rock that soul patch? You have the transformative power and the decision at your fingertips to make it happen. Want to rock that chinstrap beard that was so prevalent in the last decade? Well, do it dude. What makes this transformation possible to undertake? The will, vision, guts and tools to initiate the new path, the new direction. 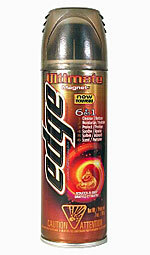 Speaking of tools, the new Edge Ultimate 6-in-1 Shave Gel can aid your transformation. Think of it as your Sherpa on a journey to a new you. So what are the six benefits combined to form this unique shave gel that forms like Voltron when it’s time to get busy? It smooths, protects, moisturizes, cleanses, softens and then leaves the skin smelling great. Six things at once, which is what the average man is doing at once anyway in his personal life. Edge takes care of the six most important components for you, so you don’t have to worry about it. Edge has got your back so you can reach the Edge of Greatness. Once you’re on the precipice, the outcome is solely up to you and your application of will. The first thing I noticed (and liked) when I sprayed the gel in my hand was that it didn’t foam up to a ridiculous level, but did somewhat while maintaining its function as a gel simultaneously. When I applied it to my face, it was entirely soothing and smooth. It didn’t glop on but covered the surface of my face easily. Having the gel on my skin felt good; it made my skin come to life with a feeling similar to an exfoliating agent. So, I let the gel sit on my face for a moment and just relaxed. The more I worked the gel into my skin, the more it came to a lather. So if you want a very lathery shave, you have that option. Or you can just apply it in its natural form and proceed to shave that way. When it was time to shave, the gel stayed moist and came off with ease. The new Edge Ultimate 6-in-1 Shave Gel is as versatile, flexible and well-rounded as you and your ever-changing journey of self-presentation. And at just $2.99 a can, the value far exceeds the retail cost. So, what new direction will you choose to head today?